Four repeated domains in the Fasciclin I family of proteins, present in many other contexts. 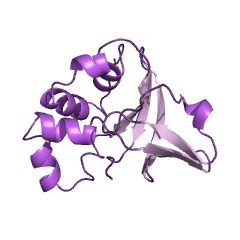 The FAS1 (fasciclin-like) domain is an extracellular module of about 140 amino acid residues. It has been suggested that the FAS1 domain represents an ancient cell adhesion domain common to plants and animals [(PUBMED:7925267)]; related FAS1 domains are also found in bacteria [(PUBMED:7822037)]. 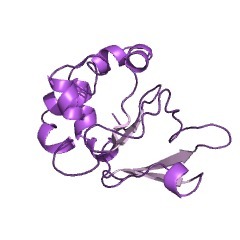 The crystal structure of FAS1 domains 3 and 4 of fasciclin I from Drosophila melanogaster (Fruit fly) has been determined, revealing a novel domain fold consisting of a seven-stranded beta wedge and at least five alpha helices; two well-ordered N-acetylglucosamine groups attached to a conserved asparagine are located in the interface region between the two FAS1 domains [(PUBMED:12575939)]. Fasciclin I is an insect neural cell adhesion molecule involved in axonal guidance that is attached to the membrane by a GPI-anchored protein. 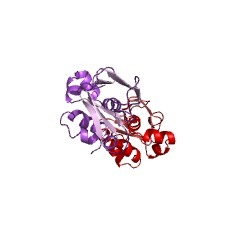 FAS1 domains are present in many secreted and membrane-anchored proteins. 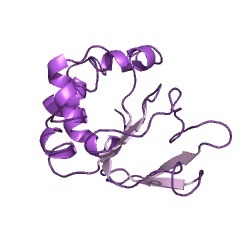 These proteins are usually GPI anchored and consist of: (i) a single FAS1 domain, (ii) a tandem array of FAS1 domains, or (iii) FAS1 domain(s) interspersed with other domains. 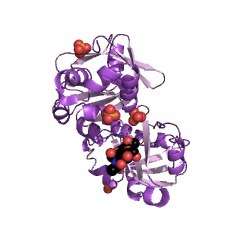 Fasciclin I (4 FAS1 domains). Human TGF-beta induced Ig-H3 (BIgH3) protein (4 FAS1 domains), where the FAS1 domains mediate cell adhesion through an interaction with alpha3/beta1 integrin; mutation in the FAS1 domains result in corneal dystrophy [(PUBMED:10906123)]. Volvox major cell adhesion protein (2 FAS1 domains) [(PUBMED:7925267)]. 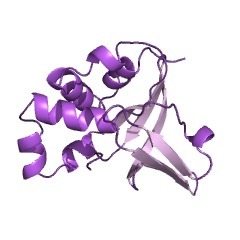 Arabidopsis fasciclin-like arabinogalactan proteins (2 FAS1 domains) [(PUBMED:16944204)]. 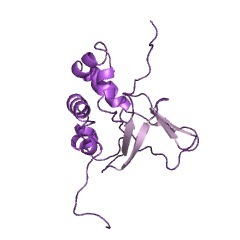 Mammalian stabilin protein, a family of fasciclin-like hyaluronan receptor homologues (7 FAS1 domains)[(PUBMED:15345724)]. 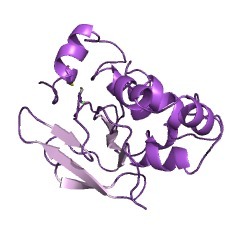 Human extracellular matrix protein periostin (4 FAS1 domains). 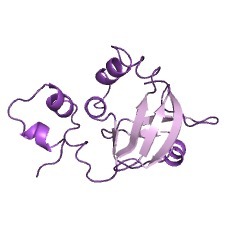 Bacterial immunogenic protein MPT70 (1 FAS1 domain) [(PUBMED:7871388)]. The FAS1 domains of both human periostin (Q15063) and BIgH3 (Q15582) proteins were found to contain vitamin K-dependent gamma-carboxyglutamate residues [(PUBMED:18450759)]. Gamma-carboxyglutamate residues are more commonly associated with GLA domains (IPR000294), where they occur through post-translational modification catalysed by the vitamin K-dependent enzyme gamma-glutamylcarboxylase. There are 36584 FAS1 domains in 21188 proteins in SMART's nrdb database. Taxonomic distribution of proteins containing FAS1 domain. This tree includes only several representative species. The complete taxonomic breakdown of all proteins with FAS1 domain is also avaliable. Click on the protein counts, or double click on taxonomic names to display all proteins containing FAS1 domain in the selected taxonomic class. Identification of motifs for cell adhesion within the repeated domains of transforming growth factor-beta-induced gene, betaig-h3. betaig-h3 is a transforming growth factor-beta-inducible cell adhesion molecule that has four characteristic homologous repeated domains. We made recombinant betaig-h3 proteins, which were highly active in mediating human corneal epithelial (HCE) cell adhesion and spreading. The 2nd and the 4th repeated domains were sufficient to mediate HCE cell adhesion. A sequence analysis showed that aspartic acid (Asp) and isoleucine (Ile) of the 2nd and the 4th domains are highly conserved in many fasciclin 1 homologous (fas-1) domains. Substitution mutational study identified these two amino acids are essential for cell adhesion. Synthetic peptides containing Asp and Ile, NKDIL and EPDIM derived from the 2nd and the 4th domains, respectively, almost completely blocked cell adhesion mediated by not only wild type betaig-h3 but also each of the 2nd and the 4th domains. These peptides alone were fully active in mediating cell adhesion. In addition, we demonstrated the functional receptor for betaig-h3 is alpha(3)beta(1) integrin. These results, therefore, establish the essential motifs within the 2nd and the 4th domains of betaig-h3, which interact with alpha(3)beta(1) integrin to mediate HCE cell adhesion to betaig-h3 and suggest that other proteins containing Asp-Ile in their fas-1 domains could possibly function as cell adhesion molecules. Midline Fasciclin: a Drosophila Fasciclin-I-related membrane protein localized to the CNS midline cells and trachea. Drosophila Fasciclin I is the prototype of a family of vertebrate and invertebrate proteins that mediate cell adhesion and signaling. The midline fasciclin gene encodes a second Drosophila member of the Fasciclin I family. Midline Fasciclin largely consists of four 150 amino acid repeats characteristic of the Fasciclin I family of proteins. Immunostaining and biochemical analysis using Midline Fasciclin antibodies indicates that it is a membrane-associated protein, although the sequence does not reveal a transmembrane domain. The gene is expressed in a dynamic fashion during embryogenesis in the blastoderm, central nervous system midline cells, and trachea, suggesting it plays multiple developmental roles. Protein localization studies indicate that Midline Fasciclin is found within cell bodies of midline neurons and glia, and on midline axons. Initial cellular analysis of a midline fasciclin loss-of-function mutation reveals only weak defects in axonogenesis. However, embryos mutant for both midline fasciclin and the abelson nonreceptor tyrosine kinase, show more severe defects in axonogenesis that resemble fasciclin I abelson double mutant phenotypes. Algal-CAMs: isoforms of a cell adhesion molecule in embryos of the alga Volvox with homology to Drosophila fasciclin I. Proof that plants possess homologs of animal adhesion proteins is lacking. In this paper we describe the generation of monoclonal antibodies that interfere with cell-cell contacts in the 4-cell embryo of the multicellular alga Volvox carteri, resulting in a hole between the cells. The number of following cell divisions is reduced and the cell division pattern is altered drastically. Antibodies given at a later stage of embryogenesis specifically inhibit inversion of the embryo, a morphogenetic movement that turns the embryo inside out. Immunofluorescence microscopy localizes the antigen (Algal-CAM) at cell contact sites of the developing embryo. Algal-CAM is a protein with a three-domain structure: an N-terminal extensin-like domain characteristic for plant cell walls and two repeats with homology to fasciclin I, a cell adhesion molecule involved in the neuronal development of Drosophila. Alternatively spliced variants of Algal-CAM mRNA were detected that are produced under developmental control. Thus, Algal-CAM is the first plant homolog of animal adhesion proteins. Sequence analysis and neuronal expression of fasciclin I in grasshopper and Drosophila. The fasciclin I, II, and III glycoproteins are expressed on different subsets of axon bundles (fascicles) in insect embryos and are thus candidates for surface recognition molecules involved in growth cone guidance. Here we present the sequence of grasshopper fasciclin I and the identification and sequence of the Drosophila fasciclin I homolog. In both species, fasciclin I appears to be an extrinsic membrane protein with a signal sequence but no transmembrane region; the protein comprises four homologous domains of approximately 150 amino acids each. Antibodies against Drosophila fasciclin I reveal that it is expressed on the surface of a subset of commissural axon pathways in the embryonic central nervous system and on all sensory axon pathways in the peripheral nervous system. This pattern of expression is similar to that in grasshopper. SwissProt sequences and OMIM curated human diseases associated with missense mutations within the FAS1 domain.